After undergoing an overhaul by Brookville Equipment Corp., the first of seven MTA Metro-North Railroad maintenance locomotives re-entered service last weekend. Around the same time, a second unit began its journey back to New York from Brookville's plant in Pennsylvania. The remaining five units will cycle through a progressive locomotive overhaul program and gradually re-enter rescue and maintenance-of-way service for Metro-North through 2017. The overhaul is expected to add a minimum 20 years of service life to the locomotives, Brookville officials said in a press release. Brookville Equipment Corp. is overhauling seven of MTA Metro-North Railroad's maintenance vehicles. The units are being rebuilt as GP35R locomotives, which requires a complete teardown and rebuild, including restoration to the frame, engine, air brakes and trucks, along with a complete refinishing. 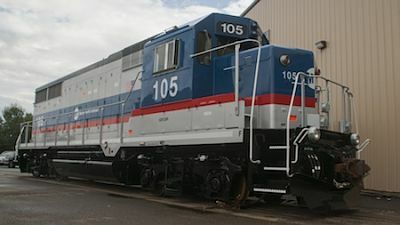 In addition, several modernizations are being made to the locomotives, such as the integration of a new locomotive control system that provides wireless diagnostics for maintenance personnel and helps improve rail adhesion, Brookville officials said. Originally manufactured by General Motors Electro-Motive Diesel in 1964, the locomotives underwent a light overhaul more than 20 years ago. Brookville secured a contract to rebuild the seven units as GP35R locomotives in 2013.